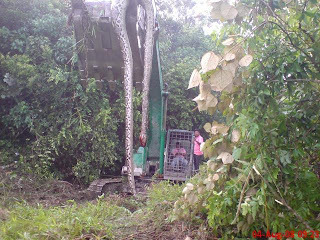 Anything & Everything: Gigantic Python near Curtin Sarawak Malaysia? Well, everywhere now is forwarding an e-mail regarding a big Python was found at Curtin Sarawak Malaysia (CSM) area, to be specific, Senadin, Miri, Sarawak. I don't know about the full story, however, it was found (either death or they kill) during the bush fire in Miri, which caused haze eventually. From the picture below, I believe it was killed by the 'head hunters', just look at its bleeding head.